NIA CHARLESTOWN NEVIS (May 10, 2016) — Minister responsible for Aviation in St. Kitts and Nevis Hon. Mark Brantley says his participation in the 5th conference of the International Civil Aviation Organization (ICAO) Aviation Training and TRAINAIR PLUS Global Symposium on International Air Transport Cooperation in Seoul, Republic of Korea from May 11-13, 2016 is of benefit to the people of the Federation. 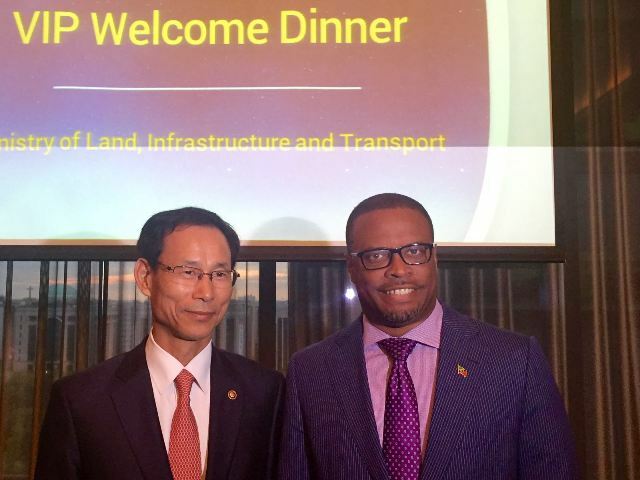 Speaking to the Department of Information after his arrival in Seoul on May 10, 2016, Mr. Brantley indicated that his participation presents an opportunity to seek possible training in the area of aviation for the people of St. Kitts and Nevis. “I have responsibilities for Aviation but it also presents a very real opportunity to get training possibilities for our people. “So I encourage our people particularly our young Sixth Formers and the like, who have an interest in aviation to get in touch because we would like, of course, to position our people to take advantage of this growing industry,” he said. The Minister who is also responsible for Foreign Affairs, noted that he is attending the event on the invitation of the government and people of the Republic of Korea and it will afford him the opportunity to engage in “very high-level discussions” at no cost to the tax-payers of St. Kitts and Nevis. Therefore, it is a “win-win situation” and offers an opportunity to advance the interest of the twin-island Federation. Mr. Brantley is slated to speak on the future of aviation at the opening ceremony. He is also expected to render opening remarks. He described his reception as overwhelming and stated that included in the 500 participating countries are Equatorial Guinea, Bukina Faso, Lybia, Guatemala, Venezuela and Mexico. The meeting organised by the United Nation’s specialised agency ICAO and hosted by the Ministry of Land, Infrastructure and Transport (MOLIT) and the Incheon Airport in Korea, aims to address various issues and the latest developments in the aviation training sector. It will serve as a venue for the exploration of new policies and technologies in global aviation, as well as for strengthening of international cooperation among participating nations. It will also bring together high-level representatives from civil aviation and authorities and a number of directors and managers working for training organizations.